It has been pretty crazy house-wise around here the last couple weeks. I think I have about 4 or 5 projects I'm working on, and we've been having our upstairs bathroom worked on. Let's just say that its been interesting. Behold, the Around the House Tour! 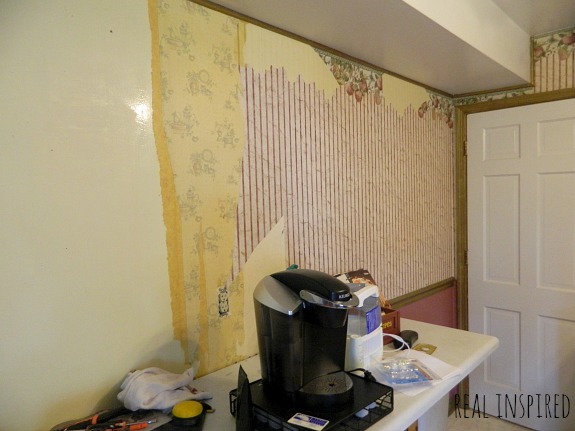 I've made significant progress on our kitchen wallpaper. About half done, I think. I cannot wait until this is done! 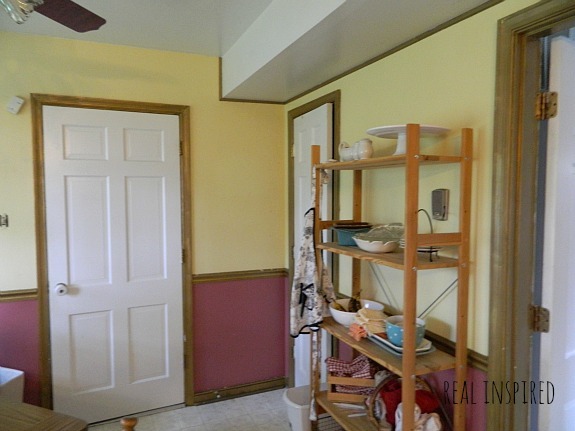 My goal is to get the wallpaper out and all the walls and cabinets painted by Christmas. I know, I know, I really need to hurry if I'm going to make that goal. Seriously, I do. I've been taking my sweet time about it and I keep getting distracted. This week I am buckling down and working on it with a vengeance...right after my nap. Doesn't it look so much better already with all that busyness off the walls? And now we come to our upstairs bathroom. I've mentioned a few other times that this room has issues. Well, we never knew how bad those issues were until now. They are legion. 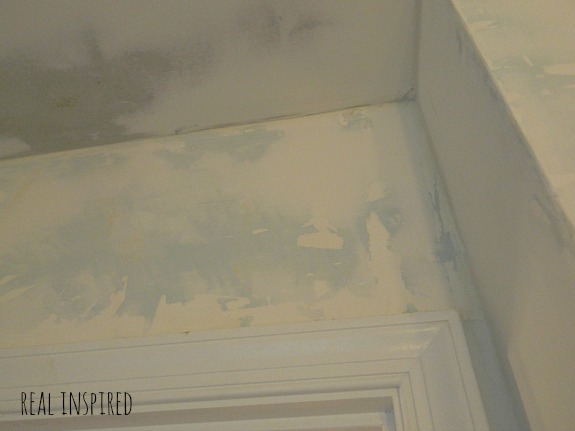 The walls were peeling, the ceiling was bubbling, and the mildew was growing. The fan was so cruddy up inside that it wasn't pulling any air, causing massive mildew and rust problems. When the paint was scraped off, it started taking chunks of drywall with it. Apparently, there wasn't primer underneath it. 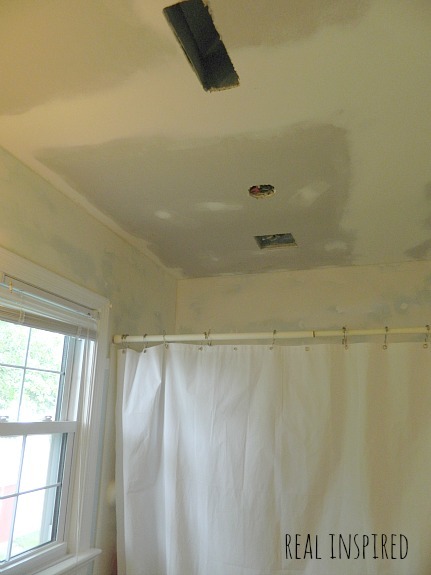 Humid bathrooms plus no primer underneath the paint is a very bad thing. And so there were multiple layers of drywall mud to be applied and sanding to be done. But we weren't done yet. Even with the ceiling scraped and mudded, it started bubbling again within 24 hours! The short term fix was to screw 1/4 inch drywall slab over the ceiling. I'm planning on getting the bathroom primed this week to get everything sealed up. Then I have to pick a white paint that goes with the white tile. The previous paint was too bright a white and it bugged me. Now I can fix it! So those are the big project happenings around here at the moment that are keeping me from all my little projects. This weekend we'll be helping my In-Laws move into their new house and helping arrange furniture and such. I'll bring my trusty camera along to snap some pictures of the progress so I can share it with you later! Ever have a really big project that got bigger once you started? Horror stories like our bathroom? Do share!